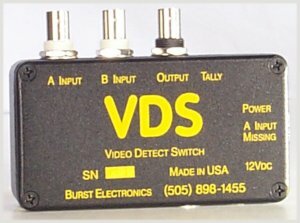 The Burst Electronics Model VDS (and the VDS-3, a 3 channel version) detects the presence of composite video at its A input and outputs this video. If loss of video on the A input is detected, then the unit switches to the B input, lights a Red LED (VDS only), and energizes an internal "tally" relay (standard on VDS and VSA, optional on VDS-3). This relay may be used to control external devices. The tally relay has both normally closed and normally open contacts (Form C relay). The Model VSA includes stereo audio switching, audio follow video.